The Howick College Kapa Haka performed at the launch ceremony for the Howick Coast Kahui Ako Community of Learning. 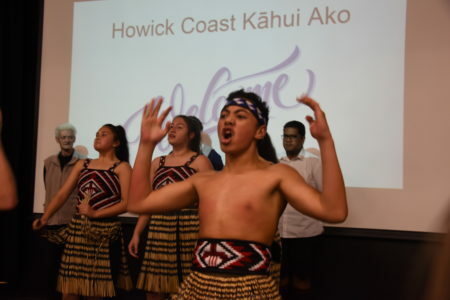 Teachers from schools as far away as Clevedon gathered at Howick College last week to celebrate the launch of the Howick Coast Kahui Ako Community of Learning (COL). One of 51 Communities of Learning in Auckland, the Howick Coast COL is about schools working together to improve performance levels among all students. The COL comprises eight local schools – Beachlands School, Botany Downs School, Brookby School, Clevedon School, Howick College, Howick intermediate, Howick Primary and Maraetai Beach School. Howick Coast COL Principal Julie Schumacher says principals and teachers from all schools will work together to find innovative ways to support students as they move through the education system. “It’s about us being able to achieve something more than we can achieve on our own,” she says. Schumacher says its also about creating an area wide standard so that students changing schools within the same area can expect the same high level of education. Principals and teachers from all schools will work together to set achievement challenges and action plans to ensure the success of more and more of their children and young people, she says. Education Minister Nikki Kaye announced last month that the Howick Coast Col is one of 13 to be set up through New Zealand, taking total number of COL’s across the country to 210. “More than 580,000 children and young people are now in a Community of Learning. Communities bring together early learning services, primary and secondary schools as well as tertiary providers to work together to raise achievement for all their children and young people,” Kaye said in a press release.